I'll let the historians do the overall Scooter background. What I will say is that the A-4C (AD-2N) was the first 'all weather' version of the A-4. Basically an A-4B with improved navigation equipment to allow it to fly in some nasty weather, the A-4C was built in rather large numbers, nearly 700, and was the backbone of light attack in the early years of the Vietnam war. Easy to maintain, easy to fly and with literally an unlimited airframe fatigue life (providing it was properly maintained), the Scooter was a favorite of pilots for over a decade. The aircraft was so well designed and such a hit that the many variants have been widely exported and even today still serve in non-US air arms. The early versions (A-4B/C) have only recently been retired from service in some countries, more for reasons of obsolescence than for any structural reason. I'm sure that if some way to upgrade these aircraft could be found, they would still be plying the skies. Even though the Hasegawa 1/48 A-4 is now in its third version and fourth boxing, somehow, I've missed doing a preview on the kit. Heck, there are at least two full build A-4E articles in the archives! 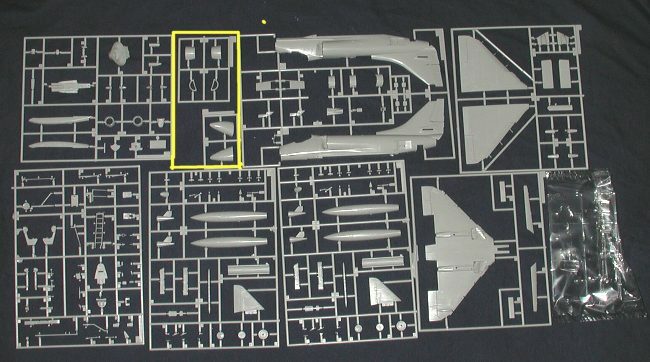 As you can see from the picture of the sprues, there is very little difference between the A-4E/F and this kit. Even less with be different with the B model recently released. I've outlined those parts different in this kit. Those with sharp memories will note that the fuselage halves are not the same (the E/F gives a complete fuselage half with the nose attached). However, all of the stuff between the fuselages on the sprue is the same. 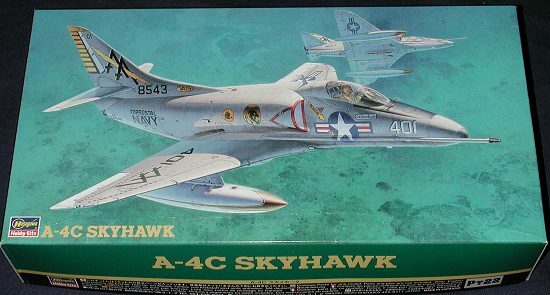 Like the earlier A-4E/F kit, this one is pretty complete and includes parts that will not be used when doing this version. For instance, you won't need outboard wing pylons nor the avionics hump for a straight A-4C. Now the upgrade to A-4L, which was used mainly by the Navy and Marine Reserves, used both of those items. Also like the earlier version, there are no weapons. I've harped on that before so won't repeat myself on this omission. I fully expect this kit to build just like the A-4E/F I did a while back. That kit was a bit fiddly and had some fit problems with the drop tank fin section and the inserts for the guns. It could also use a better seat and interior. Not that the kits ones are bad, just that they lack the fine detail that aftermarket resin can provide. OK, the seat is bad. Get a True Details one (which is pretty cheap) and forego the new interior if you want to save some money. This kit comes with a pretty impressive decal sheet. It includes two aircraft; one is the box art plane from VA-15. The gold on the sheet is well done, though I don't relish having to put in all those small decals in the indentations of the rudder. The other is from VA-153. Most of the markings for this one are on the fin. You have two choices. One is that you can use the ready-made blue fin and hope for the best in getting it in place. Or, you can paint the fin blue yourself and apply markings over it. Whichever you choose, it will make for a pretty impressive scheme. 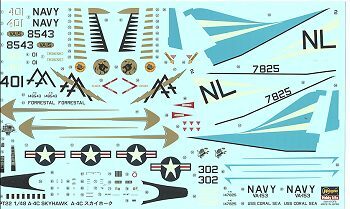 The kit decals are typical of Hasegawa decals in that they are a bit thick and the white is a bit more of an ivory color. They did provide a distorted insignia to go over the refueling probe, which is often missed in aftermarket sheets. Another choice is forget about the kit decals and choose one of the many new sheet from Superscale and others for this kit. You can see some of these in the decal review section. It is a case of having more choices than kits!! There is no doubt that this kit will sell well. It is interesting to note, though, that after the initial flurry of purchases and production of the E/F kit, they have been sitting on the shelves. It is a shame and we really should buy these so that Hasegawa can hurry up and get out the TA-4J that I have been wanting for over 20 years!!! I can recommend this kit to those who can handle the sometimes fiddly bits.